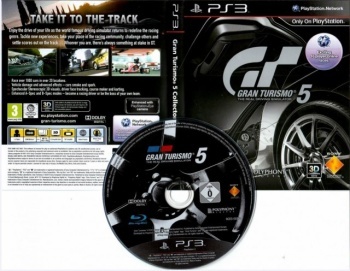 Gran Turismo 5 doesn't even have an official release date yet but it looks like some lucky race fans have already got their hands on leaked copies of the game. The launch of Gran Turismo 5 is rapidly degenerating into an all-out debacle. In October, Sony announced that the long-delayed racing sim had been pushed back once again, from a firm November 2 to a far squishier "by the end of the year." Fans who had already been waiting for half a decade howled, while "industry sources" and some retailers indicated that the game was far more likely to come out in 2011, leading creator Kazunori Yamauchi to reveal that the game had actually gone gold and that "the discs are being stamped as we speak." Now it appears that things are even further along than that: According to GT Planet, "real, legitimate copies of Gran Turismo 5" first appeared in Australia and are now turning up in Europe as well. Copies of the German version of the GT5 Collector's Edition, minus all the bonus loot, were apparently on a Czech auction site, where they were "quickly snatched up." GT Planet also has photos of the disc, case and menu screens, a trophy list and even a few minutes of gameplay video. There are some questions as to whether or not the mounting evidence of disaster is entirely legit but assuming it is, Gran Turismo 5 is well on its way to becoming one of the most spectacular lessons in "how not to do it" in years. It's a stunning litany of mismanagement: delays, excuses, misinformation and now this biggest kick in the junk of all, stamped and printed copies of the game hitting the market before Sony is even ready to slap an official date on the thing. It seems to me that at this point, Sony's best bet to mitigate the damage is to throw it out to the public as soon as it can, but I don't honestly expect that to happen. Which is also fine with me; after all, it's not every day you get to sit back and watch a train wreck as entertaining as this one. Amazon, for the record, still has Gran Turismo 5 listed with a December 31 release date.